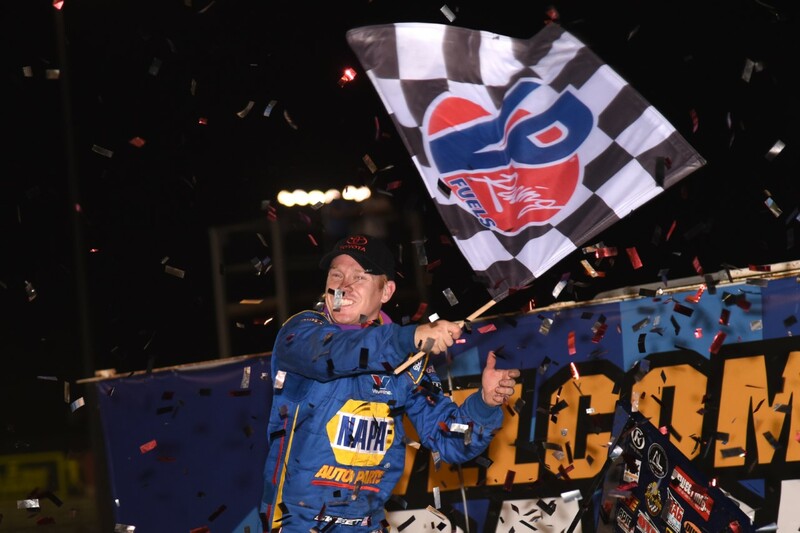 KNOXVILLE, Iowa (August 9, 2018) – Brad Sweet picked up where he left off in Sunday’s Weld Racing Capitani Classic presented by Great Southern Bank, by dominating the Thursday Toyota Night qualifier for the 58th Annual 5-hour ENERGY Knoxville Nationals presented by Casey’s General Stores. The Grass Valley, California native took home $12,000 for his win in the Kasey Kahne Racing #49. Sweet also secured himself the pole position for Saturday night’s $150,000 championship event. He will be flanked by Ohio’s Chad Kemenah, while the second row will be comprised of Wednesday high point drivers Kyle Larson and Donny Schatz. A main (started), 25 Laps, NT: 1. Brad Sweet (6); 2. Rico Abreu (2); 3. David Gravel (13); 4. Tim Kaeding (5); 5. Terry McCarl (4); 6. Chad Kemenah (8); 7. Cory Eliason (10); 8. Shane Stewart (23); 9. Carson Macedo (21); 10. Kraig Kinser (11); 11. Mark Dobmeier (1); 12. Jacob Allen (7); 13. Sam Hafertepe Jr. (15); 14. Parker Price-Miller (22); 15. Spencer Bayston (9); 16. Wayne Johnson (18); 17. Jamie Veal (24); 18. Sammy Swindell (17); 19. John Carney II (3); 20. Chris Martin (19); 21. Gary Taylor (20); 22. Dave Blaney (16); 23. Harli White (12); 24. Josh Schneiderman (14). Lap Leader: Sweet 1-25. Hard-charger: S. Stewart. Posted by Press Release on Aug 9 2018. Filed under Professional Sports. You can follow any responses to this entry through the RSS 2.0. Both comments and pings are currently closed.